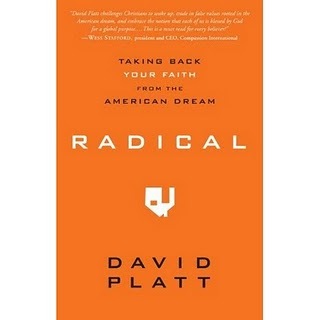 My second most viewed blog of this year was a book review of David Platt’s “Radical.” I read a lot, and at one time I considered making this blog a book review site. I am certain the hits I got on this review are due solely to the popularity of Platt’s book. However, there are other books I would recommend way ahead of Platts. You can click here, here, and here to find other reviews. Oooohhh, and don’t forget about that other one (click here). I can usually get one whole book read on the to-and-from legs of a flight to the other side of the Rocky Mountains. This particular trip I read David Platt’s Radical. While I was lining up at the gate, waiting for my boarding group, I took his book out of my satchel and tucked it under my arm. That way I could throw my satchel in the overhead and keep the book with me. While I stood there, three different people came up to me and said, “I see you’re reading Radical. It’s a good book.” On the actual flight I saw another woman reading Radical. I have not seen that with a Christian book since Don Miller’s Blue Like Jazz. I expect it with Twilight garbage or Harry Potter escapism, but not Christian nonfiction. So since everyone seems to be reading Platt, I thought I would throw in my observations about his book. The Bad Stuff: There is very little in Radical that could be labeled “Bad,” but I do have a couple of things against Platt. First, there are some places in the book where he tends to be standing up and shouting, “Look how great me and my church are. You are a loser because you are not us.” I kept expecting for one of his illustrative stories to begin, “One young couple in our church talked North Korea into giving up all its nuclear weapon plans.” Second, and this is closely related to the first, Platt writes from a sense of “megachurch guilt,” but not all churches in North America are megachurches. He probably is so insulated that he doesn’t realize how off-putting it is to read of his 50 million dollar building programs or of all the wealthy business people in his church. Sure, I am glad they are doing great things for God, but to those of us in regular churches not in the deep southeast, it leaves a bad taste in our mouths. The Arguing stuff: You knew this was coming right? I mean, I’ve never read a book I didn’t argue with. At times Platt takes a very strong Calvinistic leaning, particularly in the opening chapters. Indeed, his Calvinism is so strong that it almost detracts from the overall point he is making in the book—that point being each person’s responsibility for substituting the American way of life for the gospel way of life. I wonder if he sees the irony. I could also argue with Platt about the reality of how best to help the poor around the world. His arguments for how to help are more emotional than perhaps, effective. One more thing on the arguing scale; and it might not pertain, but in reading the book I admire David Platt, but I do not know if I would like him. I bet he is a very hard person to get along with. All in all, I highly recommend Radical as a read that will challenge a person to be a better Christ-follower. If that is your goal, then read Radical. If you are sensitive and don’t take someone meddling into your life very well, then by all means, do not read Radical.